Most of us grow up with a favorite toy. I had two, Mr. Brown and Baby Henry. A while back to went through one of my bags of old stuffed animals, looking for ones I didn’t mind sharing with my two little ones. No need for great toys to sit in a bin when I have two little ones. Mr. Blue eyes of course went right for mommy’s favorite, Mr. Brown. If you remember, I shared a photo of him. I’ve been looking for a great huggable size stuffed animal for the kids. They just don’t seem to make them anymore. The stuffed animals are either mini sized or huge! They fill them with beans instead of stuffing. With how much blue eyes loves Mr. Brown, I decided to see if the company was still around. Apparently Mr. Brown was originally named Honey Jo, and he’s a bit of a collectors piece now. That’s okay though, I found not one, but two Mr. Brown’s available. With some help from Grandma, we got them ordered and they arrived today! I opened up the packages and felt like I was looking at the past. The sweet faces of my old friend were staring at me. Definitely a lot fluffier and brand new plush, but still the loveable face that kept me company through 27 years of life. My baby boy’s face got huge with smiles as his little fingers grabbed the bear. Even our little princess was giggling when I put one in her lap. 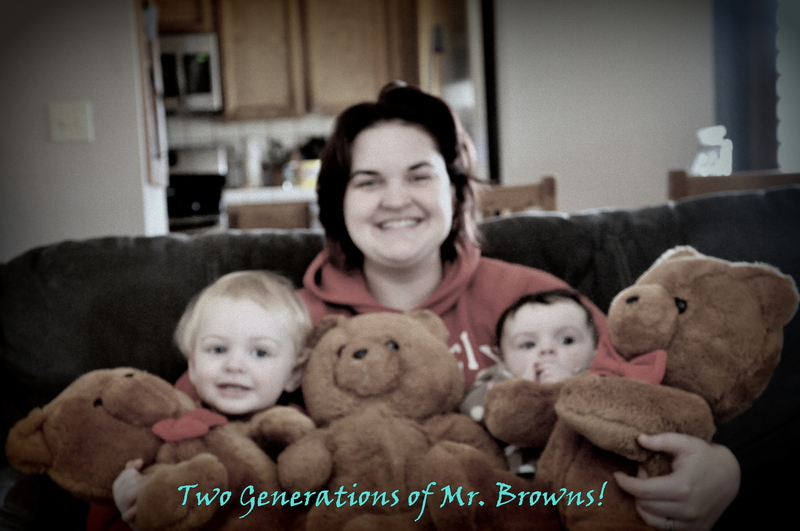 I can’t wait to see these two little bears go through life with my babies the way Mr. Brown did for me. Posted in Baby, blogging and tagged babies, baby, blue eyes, childhood toys, dakin, honey jo, little bug, princess, stuffed animals, stuffed bears, toys. Bookmark the permalink.